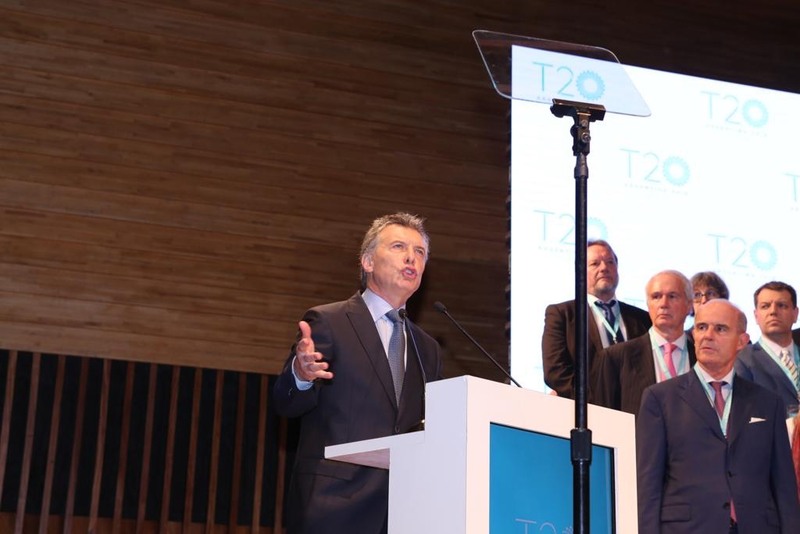 In an event where there were almost a thousand participants, and with the presence of T20 Task Force co-chairs, the Advisory Board and the Steering Committee, the T20 Argentina presented the Communiqué to the president of Argentina Mauricio Macri. Adalberto Rodríguez Giavarini, the president of CARI, and Jorge Mandelbaum, the president of CIPPEC, lead the two institutions presiding the Think 20 (T20) and were the officials who presented the document to the president. The Communiqué contains the engagement group’s public policy recommendations which the group believes should be priorities at the G20 Leaders meeting at the end of the year. “Today I came to receive the packet of policies that was created after many months of work. I know you have addressed nearly all of the topics on this year’s G20 agenda. 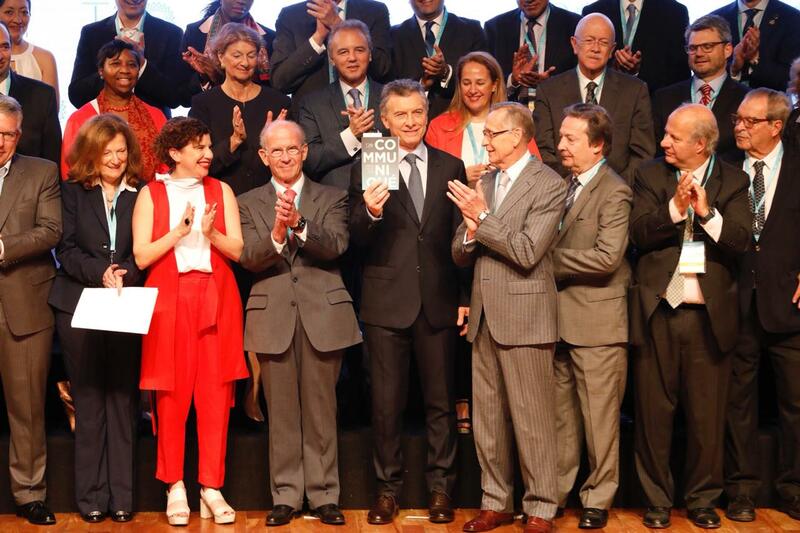 I am sure that this document will be useful for the constructive work for this year”, said Mauricio Macri. In his speech, he added: “On the G20’s path, the role of engagement groups is fundamental. It is you who bring us a new perspective to this dialogue process that we are taking to civil society. Global solutions need a compromise and action from all sectors of society. It means a collective construction, which is why it is so important that their contributions are concrete recommendations orientated towards action. This is the only way to have a positive impact on reality. The main aim of this exercise is to construct a better future for our people”. “This process highlights to the Argentine people the need for multilateral governance that is only possible if our pillars are democracy, transparency and sustainable trade. History shows us that dialogue and consensus of countries is the only way for us to build a better world. This recommendations are a perfect example of this,” said Adalberto Rodríguez Giavarini, president of CARI. In her speech, Julia Pomares said: “Think tanks need to step up to the challenge and show that technical knowledge is at the service of building consensus on global urgent issues. But we need to abandon the comfort zone of the technocratic analysis and involve in the global conversation. Here in this building there are more than 1,000 thousandthinkers from 68 countries. The T20 provided a critical and independent vision on those issues that are shaping global governance”. The handover of the document took place on September 17 during the T20 Summit in which nearly 200 international experts took part, along with almost a thousand participants including specialists from the main think tanks of the world, Argentine government officials and representatives from international organizations and the business community. There are a number of topics the recommendations focus on such as the future of work, education and politics, and how to combat the effects of climate change (LINK). The proposals also suggest policies to promote gender economic equity and tackle the original challenges of the G20: international financial stability, commerce and tax cooperation and more. Download the T20 Argentina Communiqué.